Immobilis Pro Tempore is an immersive sound and visual installation resulting from a sound creation workshop bringing together various Bolivian artists and composers for the purpose of artistic research on multimedia and transmedia practices. 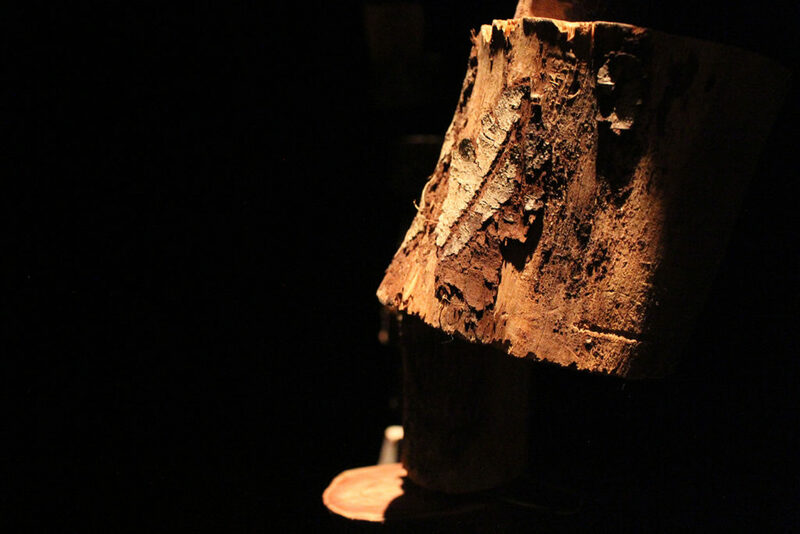 With this work, I wanted to immerse the visitor in the heart of a forest reconstituted from pieces of recycled tree trunks. The ghostly appearance of the landscape thus proposed, refers to the violent deforestation that rages across the South American continent and questions our denial as a society to be part of the world that surrounds us. Can Man live in the world without accepting to be part of it? The piece is a composition of the sounds of a natural forest but also the attacks that it undergoes from logging. During this walk in the forest where the visitor triggers a whole game of shadows and lights by motion sensors, a voice in Spanish continuously declaims a sentence of the movie “It Was a Forest“, resonating like an incantation that would exhort to overcoming our fear of reality but also as a warning about the risks of such a rejection of our existence: “Trees can be immortal, and it’s scary”. Previous ProjectA dónde quieres llegar?